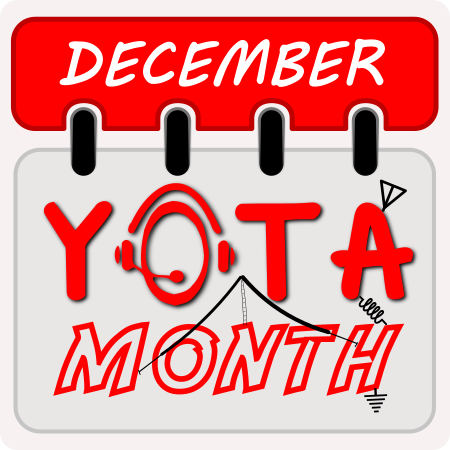 During the month of December, several youngsters will activate callsigns with YOTA as the suffix. The idea of this is to show the amateur radio hobby to youth and to encourage youngsters to be active within the hobby! Consider giving a demonstration at a school or local club, gather together with your friends, grab a pizza and make some QSOs or enjoy a great pile-up. Let’s show this great hobby to the world! Feel free to make a QSO with the youngsters, they are happy to get some attention and exchange information. Licensed and unlicensed youth will be making QSOs, be aware this could be their first radio contact ever so give them a chance to experience a possible new hobby without getting impatient, we all remember our first contact. Like previous years there will be a special award available for persons who worked several YOTA stations. 1- Follow the rules. Although this is a friendly activity, some rules are needed. 3- Maximum of 2 callsigns per country. If you are willing to make an exception, for example your country has several prefix districts, feel free to contact us with your request. 5- We kindly ask you to upload the ADIF log on a daily basis. At least all QSOs must be sent as an ADIF file before 10th January 2017. 6- All QSOs must be made in December 2016. *We are aware that it is not possible to have a callsign with YOTA in suffix in all countries. Is this also your case and would you like to take part, contact us. *All applicants applying for a YOTA callsign should be a member of an IARU member society. Deadline for registration will be closed on 20 November 2016. How cool is that?! LY1BWB club will be QRV 24/7.